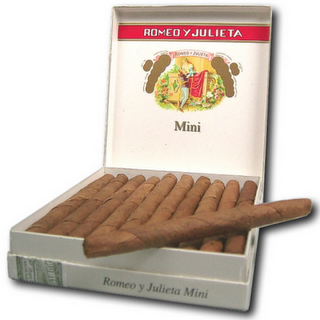 Romeo y Julieta Minis | Old Morris Tobacconist Victoria BC, Fine Cigars, Humidores and Tobacco Merchantile. The RYJ Mini is a clean-looking, dapper stick with a sweet, spicy and ultra smooth taste. The easy draw and thick smoke throughout make it an excellent medium-bodied cigarillo. Great for a smoke break or as a complement to a short espresso.